Dallas Yoga Festival | The most vital muscle in your body…. 26 Jan The most vital muscle in your body…. A core muscle connecting the lumbar vertebrae to the femur is called the psoas muscle (pronounced SO-as). Structurally, your psoas muscles are very deep-seated in your core and because of its location, they are the primary connecting muscles between your torso and your legs. They affect your posture, help to stabilize your spine and determine the range of motion. They usually function along with the Iliacus muscle and hence generally grouped together as Iliopsoas. 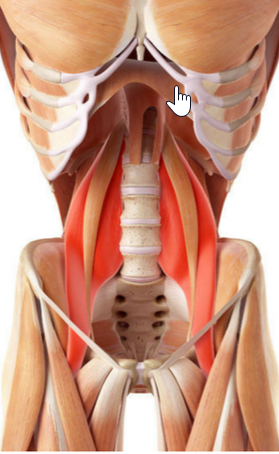 When does the body use the Psoas muscle? When you walk, run, climb up the stair or even when you sit – your psoas muscle is in action. It’s connection to the diaphragm also relates it to our breath pattern. A turbulent breath due to excitement or fear or stress causes psoas to contract. The contraction can also be as a result of very long periods of sitting, running, walking or heavy exercise routine or even sleeping in a fetal position. Strained psoas muscles can cause many of the surrounding muscles to become overused. That is why a tight or overstretched psoas muscle could be the primary cause of many or your aches and pains, including postural problems like lower backache or stiffness, lumbar disc degeneration, sciatica, discomfort in the hip socket, knee pain, arthritis etc. Because the psoas runs along the entire digestive system, any tension created in psoas can also result in constipation or diarrhea. Mental stress and unhealed traumas gets stored as stress in our bodies. Such emotional stress within the body gets the Psoas muscle to react. A chronically tight psoas continually signals danger to your body and depletes the immune system. Hence, knowing how to release the psoas muscle is important to ease a variety of spasms and chronic muscular aches. However, the psoas muscle is deep within your core and it’s not always easy to locate it or exercise it effectively. Certain Yogasanas are super effective is releasing a stressed psoas muscle. Poses like Naukasana (Boat pose), Childs pose (shashankasana), Veerasana (Hero Pose) are popular simple stretches to engage your psoas muscles and increase strength in your lumbar region. This helps to lengthen your spine as well as stretch your torso and relax your whole body. Dhanurasana (Bow Pose) helps in stretching the hips, thighs, knees, ankles and feet in one go, thereby providing relief to psoas muscle. Exploring yoga stretches and performing them on a regular basis promotes the most important muscle of your body to be happy and healthy. Try it for yourself and see if your body asks for anything more to improve your overall feeling of well-being!